The East Devonport Recreation Centre Tasmania played host to Events Nine to 12 across three days of action on Friday, Saturday and Sunday. Former World Championship competitor Mathers' weekend got off to a perfect start by taking Friday's opening event with a 6-3 victory over Ben Robb in the final. 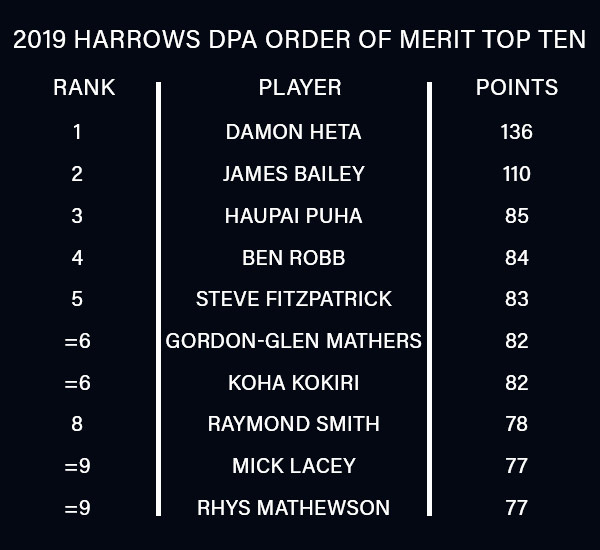 Mathers' fellow-Australian James Bailey posted averages of 93, 95 and 98 on his way to winning Event Ten to double his tally of DPA ProTour crowns in 2019 on Saturday. The second day in Tasmania ended with Mathers claiming a sixth DPA ProTour title of his career, defeating Damon Heta 6-3 in the final of Event 11, while Heta remains on top of the Order of Merit. The final $4,000 event of the weekend, Event 12, saw Australia's Raymond O'Donnell pick up his first DPA ProTour title with a 6-4 success against Shane Tichowitch in the final. The Harrows DPA Pro Tour continues with Events 13-18 at the Macquarie Inn, Dubbo from May 2-5. Visit dartplayersaustralia.com for more information on the DPA ProTour.